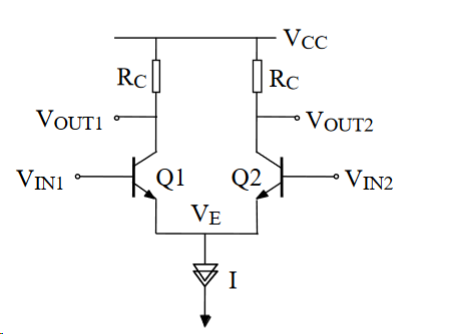 If we look at a simple long tail differential amplifier which uses BJTs how could this be explained? On a transistor level how can you show where this comes from? What actually causes this non ideal behavior of common mode voltage gain ? A=-gm * Rc/(1+gm * re). Acm=A=-gm * Rc/(1+gm * 2re). This expression shows that the common mode gain will be zero for an ideal current source (re approachung infinite) only. Note: The above (rough) calculation is accurate enough to demonstrate the systematic common mode effect caused by the a finite re. Other influences (asymmetry effects, Early-effect,...) are neglected. Not the answer you're looking for? Browse other questions tagged operational-amplifier bjt differential gain or ask your own question.